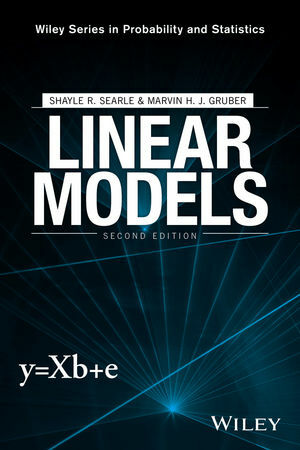 Linear Models, Second Edition is a textbook and a reference for upper-level undergraduate and beginning graduate-level courses on linear models, statisticians, engineers, and scientists who use multiple regression or analysis of variance in their work. SHAYLE R. SEARLE, PhD, was Professor Emeritus of Biometry at Cornell University. He was the author of the first edition of Linear Models, Linear Models for Unbalanced Data, and Generalized, Linear, and Mixed Models (with Charles E. McCulloch), all from Wiley. The first edition of Linear Models appears in the Wiley Classics Library. MARVIN H. J. GRUBER, PhD, is Professor Emeritus at Rochester Institute of Technology, School of Mathematical Sciences. Dr. Gruber has written a number of papers and has given numerous presentations at professional meetings during his tenure as a professor at RIT. His fields of interest include regression estimators and the improvement of their efficiency using shrinkage estimators. He has written and published two books on this topic. Another of his books, Matrix Algebra for Linear Models, also published by Wiley, provides good preparation for studying Linear Models. He is a member of the American Mathematical Society, the Institute of Mathematical Statistics and the American Statistical Association.